I Love your blog sign me up! So as the new year begins, here is my top 16KPOP songs for the year of 2010. As you could see, Shinee is at the top of my 2010 rankings for favorite song. Actually they were also my favorite group for 2010. So you might wonder why Hello is over every other songs that sold better than the repackaged album. Well first the song is something that you won’t get tired of listening to. I remember having this song on my Ipod since October and I didn’t grew tired of this song until now. 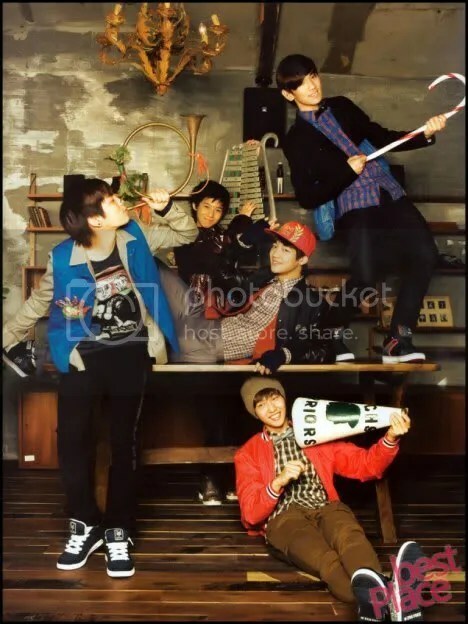 Second is that it’s vintage Shinee. Yes, Shinee isn’t that old to be called vintage. But in their last two singles before Hello (Lucifer and Ring Ding Dong) they used a much darker theme than the old ones. Another thing that made me like Hello was the vocals. I mean this one shows how they’re really a great group. Jonghyun’s vocal range is so high. Here is their first performance of the song live at Music Bank. So beautiful is at 2. Why? Because the song is so addicting. Well I kinda got over with Beautiful for about a few days now (because of IU’s Good day). However, the song is still fun. What not to like about this. It’s so different than Beast’s old song. They look much cute here. Taeyang’s I’ll be There ranks at 3. Okay to be honest 1-3 doesn’t have that much difference at all. I love those 3 songs equally I guess. Well anyways Taeyang’s I’ll be There is a superb song for a lot of reasons. One thing I found is the emotion of the song. Yes like most of Taeyang’s song it’s about a particular girl that he loves. The choreography is another awesome thing about this. The song have a very very difficult choreography as I could see. Despite all of that, Taeyang can still hit those high notes. So from 4-16 they’re actually random. They can vary depending on my mood. However, they’re still the songs that I really really liked for the whole 2010. If you have objections with that then I suggest you go to another blog site. Oricon’s 2010 First Half Rankings! If you have been following this blog a lot, then you know we post the weekly Oricon rankings every week. We’re in the middle of the year now and Oricon has released it’s First Half Rankings for the year! Arashi dominated the singles ranking with their singles Troublemaker and Monster occupying 1 and 2 respectively. AKB48 on the other hand proves that they are the most dominant girl group in Japan’s Music Scene today occupying the 3rd and 5th place. Hello! Project 2010 Winter Concert ~Mobekimasu~ Youtube! Yes! Rosicky000777 already uploaded the whole Mobekimasu concert on Youtube! 3 Down 6 to go! Our favorite KPOP girl group wins 3 in a row at Music Bank today. Do I need to spell their names to you? Well then… SNSD! SNSD! Returning this week with their overly infectious song OH! and wearing their super HOT Cheerleading outfits. The girls defeated seemingly old Rivals 2AM and CNBLUE(which won yesterday at the return of M!NET’s Countdown). And if you’ve noticed at the beginning of the song, Maknae Seohyun tripped while moving at another position. They defeated the other 2 Boy groups with 20,284. Will the 9 LOVELY ladies surpass their 9 straight weeks they did with GEE. K-on! is coming in Animax Asia! Yes! we are able to see Mio,Asuza,Yui,Mugi and Ritsu Every 8pm in Animax Asia!! March 26,2010 , Tuesday at 8pm!! The Rock Girl band is coming to rock your life! Mano Erina - Onegai Dakara Radio Rip released!! C-ute - Campus Life ~Umarete Kite Yokatta~ Live on West Wind!